CBI - China: Day 127 of 142 of the 1st Battle of Hebei. Spain: Day 295 of 985 of the Spanish Civil War. The German Condor Legion Fighter Group, equipped with He-51 biplanes, arrives in Spain to assist Francisco Franco's forces in the Spanish Civil War. Europe: The United Kingdom and France urge Czechoslovakia to make concessions to Germany over the issue of the Sudetenland. Spain: Day 660 of 985 of the Spanish Civil War. CBI - China: Day 305 of 2,987 of the 2nd Sino-Japanese War. Day 90 of 124 of the Battle of Henan. CBI - China: Day 670 of 2,987 of the 2nd Sino-Japanese War. Day 52 of 54 of the Battle of Nanchang. Day 18 of 35 of the Battle of Suizao. Japanese troops capture Suizhou and Zaoyang. 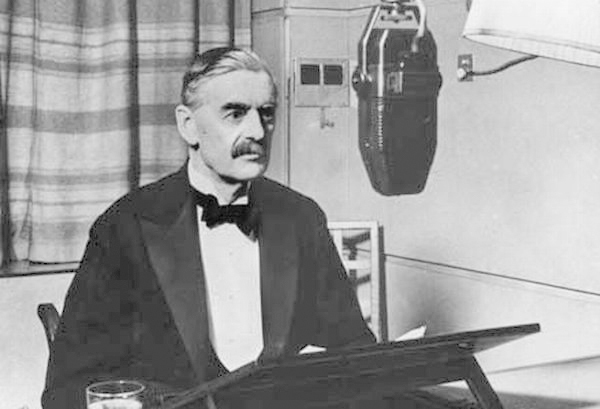 UK: British Prime Minister Neville Chamberlain faces hard criticism following the retreat of Allied forces from Norway. Parliament's confidence in Chamberlain's prosecution of the war is on the ropes. In three days, Winston Churchill will be appointed Prime Minister. History has not been kind to Neville Chamberlain. He is seen as having been very weak in his foreign policy toward Hitler's growing military build-up and muscle flexing, thus leading to the eventual outbreak of war. Yet it can be said that Britain needed time to prepare for war and that Chamberlain's appeasement gave them some desperately needed time to do so. Had war erupted a year earlier, events might have unfolded quite differently with disastrous consequences. Atlantic: The Luftwaffe attacks the British cruiser HMS AURORA off Narvik, putting her A and B gun turrets out of action and killing 7 Royal Marines. ETO - Norway: Day 29 of 63 of the Battle of Norway. ETO - Netherlands: The Dutch Army suspends all leaves. CBI - China: Day 1,036 of 2,987 of the 2nd Sino-Japanese War. Day 175 of 381 of the Battle of South Guangxi. Day 7 of 49 of the Battle of Yichang. Atlantic: The HMS SOMALI captures the German weather ship MÜNCHEN off Iceland along with documents on the operation of the Enigma cipher machine and vital code books. Prior to being boarded, the crew of the MÜNCHEN threw overboard the ship's Enigma machine in a weighted bag. However, documents on the operation of the Enigma machine were left on board, as were vital code books providing a breakthrough for Allied codebreakers. The Enigma electro-mechanical rotor cipher machine was invented by German engineer Arthur Scherbius at the end of World War I. In December 1932, the Polish Cipher Bureau first broke Germany's military Enigma ciphers. 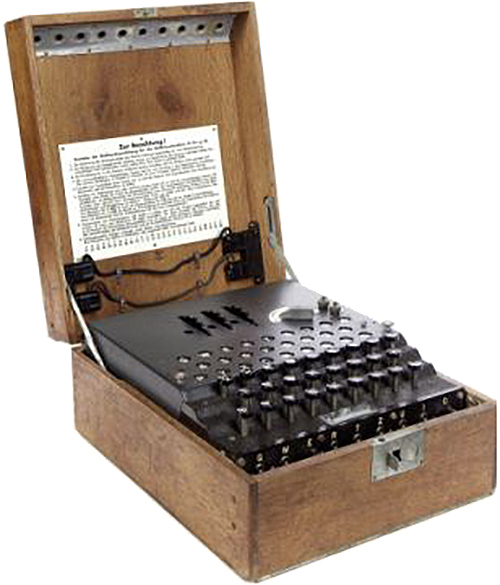 Five weeks before the outbreak of World War II, on 25 July 1939, in Warsaw, they presented their Enigma-decryption techniques and equipment to French and British military intelligence. From 1938, additional complexity was repeatedly added to the machines, making the initial decryption techniques decreasingly successful. Nonetheless, the Polish breakthrough represented a vital basis for the later British effort. During the war, British codebreakers were able to decrypt a vast number of messages that had been enciphered using the Enigma. The intelligence gleaned from this source, code-named "Ultra" by the British, was a substantial aid to the Allied war effort. The exact influence of Ultra on the course of the war is debated; an oft-repeated assessment is that decryption of German ciphers hastened the end of the European war by two years. Winston Churchill told Britain's King George VI after World War II: "It was thanks to Ultra that we won the war." Although Enigma had some cryptographic weaknesses, in practice it was only in combination with procedural flaws, operator mistakes, captured key tables and hardware, that Allied cryptanalysts were able to be so successful. Atlantic: German sub U-94 sinks the British ship IXION and Norwegian ship EASTERN STAR 150 miles south of Iceland. Atlantic: The Italian submarine TAZZOLI sinks the Norwegian ship FERLANE off West Africa. ETO - UK: Day 244 of 258 of the Blitz. The Luftwaffe bombs Liverpool for the seventh consecutive night, now 75% of the port has been destroyed. The port city of Hull is also bombed. MTO - Libya: Day 28 of 256 of the Siege of Tobruk. The Luftwaffe sinks the British minesweeper HMS STOKE docked at Tobruk. At night the British Royal Navy bombards Benghazi, sinking the Italian ships TENACE and CAPITANO CECCHI. Middle East: Day 6 of 30 of the Anglo-Iraqi War in Iraq. The Indian 20th and 21st Brigades march out of Basra to attack the nearby port of Ashar. East Africa: Day 332 of 537 of Italy's East African campaign in the lands south of Egypt. German armed merchant cruiser PINGUIN stops and captures the small British tanker BRITISH EMPEROR 400 miles off British Somaliland. The HMS CORNWALL gets the distress signal and begins sailing to the area. CBI - China: Day 1,401 of 2,987 of the 2nd Sino-Japanese War. Day 1 of 21 of the Battle of South Shanxi. CBI - Thailand: Day 219 of 221 of the Franco-Thai War (Vichy France vs Thailand). Atlantic: Day 114 of 169 of Germany's Second "Happy Time," during which U-boats sink 609 Allied ships with little risk. Netherlands: Dutch Jews are forced to wear the yellow Star of David badge. Russian Front - North: Day 242 of 872 of the Siege of Leningrad. Russian Front - North: Day 89 of 102 of the Battle of the Demyansk Pocket, another failed attempt to break the siege at Leningrad. Russian Front - North: Day 3 of 658 of the Siege of the Kholm Pocket. Russian Front - South: Day 190 of 248 of the Siege of Sevastopol, Crimean Peninsula. East Africa: Day 3 of 186 of the Battle of Madagascar. The Vichy French resistance ends but the Japanese keep fighting. CBI - Burma: Day 145 of 164 of Japan's Invasion of Burma. CBI - China: Day 1,766 of 2,987 of the 2nd Sino-Japanese War. PTO - Malaya: Day 78 of 357 of the Battle of Timor Island. PTO - New Guinea: Day 5 of 5 of Japan's Operation MO to take Australian New Guinea. Having suffered heavy losses in the ongoing battle of the Coral Sea, the Japanese pull the plug on this offensive. PTO - Philippines: Day 151 of 152 of the 1st Battle of the Philippines. PTO - Solomon Islands: Day 4 of 5 of the Naval Battle of the Coral Sea. The US and Japanese carrier planes continue clashing. Both sides keep finding and attacking small groups of ships thinking they are the enemy's main fleet. This sets up a big battle for tomorrow. ETO - France: "Greater German Television" begins broadcasting from studios in Paris taking over the transmitter on the Eiffel tower. The Royal Air Force sets up an elaborate receiving system on the coast of England to watch the transmissions, consisting mostly of newsreels and other programming for injured German soldiers in Paris area hospitals. Television was invented in 1925, though the technology and visuals were pretty crude. A bitter rivalry raged between the US, Britain and Germany for the world's first regularly scheduled television broadcasts and Nazi Germany wanted to beat the competition at all costs. 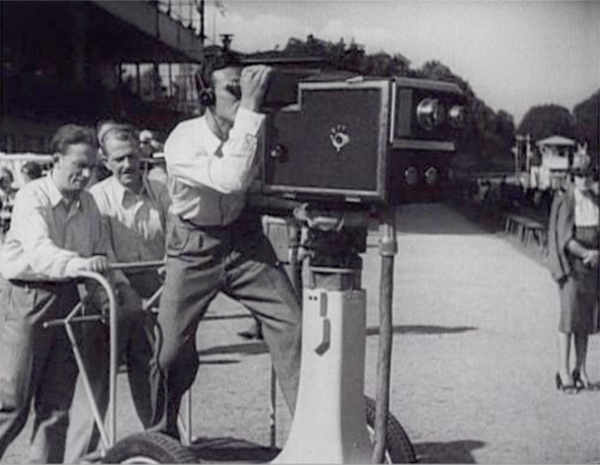 "Greater German Television" began on 22 Mar 35 with limited programming and a very small audience of party big-wigs and Germans in public television parlors in Berlin. In September of 1944, after nine years, the last program flickered across German TV screens. Germany: In a Berlin speech, Hitler says that submarine warfare is the surest way to cut enemy supply lines and it needs to be stepped up. But even as he speaks, his U-boats are being pounded in what will become known as "Black May." Russian Front - North: Day 607 of 872 of the Siege of Leningrad. Russian Front - North: Day 368 of 658 of the Siege of the Kholm Pocket. MTO - Tunisia: Day 172 of 178 of the Battle of Tunisia. Allied naval forces seal off Tunisia. RAF and US Air Forces provide air support. CBI - China: Day 2,131 of 2,987 of the 2nd Sino-Japanese War. The USS SNOOK attacks a Japanese convoy off China and sinks the HOSEI MARU. PTO - Alaska: Day 335 of 435 of the Battle of Kiska, Aleutian Islands. US 11th Air Force attacks targets on Attu and Kiska. PTO - New Guinea: Day 16 of 148 of the 2nd Battle of Lae-Salamaua. US 5th and 13th Air Forces provide air support. ETO - Germany: US 8th Air Force B-17s and B-24s bomb Berlin with maximum effort. Russian Front - North: Day 96 of 191 of the Battle of the Narva Isthmus, Estonia. Both German and Soviet troops remain in their defensive positions. Russian Front - South: Day 30 of 35 of the Battle of the Crimea. Russian Front - South: Day 30 of 60 of the Battle of Romania, 1st Jassy Offensive. Day 6 of 7 of the 2nd Battle of Targu Frumos. MTO - Italy: Day 112 of 123 of the Battle of Monte Cassino. RAF and US Air Forces provide air support. The German Gustav Line continues getting weaker. MTO - Italy: Day 107 of 136 of the Battle of Anzio. RAF and US Air Forces provide air support. CBI - Burma: Day 64 of 166 of the UK's Operation THURSDAY. CBI - Burma: Day 59 of 147 of the Battle of Myitkyina. US 10th Air Force provides air support. CBI - Burma: Day 37 of 302 of the Chinese Salween Offensive. US 14th Air Force provides air support. CBI - China: Day 2,497 of 2,987 of the 2nd Sino-Japanese War. Day 21 of 259 of Japan's Operation ICHI-GO. CBI - China: Day 21 of 39 of the Battle of Central Henan, the first offensive in Japan's Operation ICHI-GO. Chinese troops are getting pushed out of central China. CBI - India: Day 61 of 118 of the Battle of Imphal-Kohima. The Japanese begin overrunning the UK positions near Tengnoupal. British troops attack Jail Hill, but are beaten back. PTO - New Guinea: Day 69 of 80 of the Battle of the Admiralty Islands. 5th Air Force provides air support. PTO - New Guinea: Day 145 of 597 of the Battle of New Britain. US 13th Air Force provides air support. PTO - New Guinea: Day 16 of 481 of the Battle of Western New Guinea. PTO - Solomon Islands: Day 189 of 295 of the Battle of the Bougainville Islands. US 13th Air Force provides air support. Atlantic: German sub U-2336 sinks the Canadian transport ship AVONDALE PORT and the Norwegian transport ship SNELAND off the Firth of Forth, Scotland. About the same time, an RAF Catalina sinks the German sub U-320 off Bergen, Norway. ETO - Norway: German General Böhne announces the unconditional surrender of all German troops in Norway. ETO - Netherlands: The Dutch Nazi Party leader Anton Mussert is arrested. US 8th Air Force drops food and supplies to Schipol, Alkmaar, Vogelenzang, Utrecht, and Hilversum. ETO - France: Day 282 of 284 of the Battle of Brittany. ETO - France: Day 235 of 236 of the Siege of Dunkirk. Germany: German General Jodl signs an unconditional surrender to the western Allies at Reims. However, the Soviets said they would not recognize it until another was signed with them. Jodl signs another to take effect one minute after midnight on May 8th. Russian Front - Center: Day 205 of 206 of the Battle of the Courland Pocket in Latvia. Russian Front - Center: Day 22 of 23 of the Battle of Settin-Rostock, both sides of the border between Germany and Poland. Russian Front - Center: Day 5 of 6 of the Battle of Brandenberg, Germany. Russian Front - Center: Day 2 of 6 of the Battle of Prague. The Soviets launch a final assault in Czechoslovakia against what's left of the German Army. MTO - Austria: The British 8th Army crosses the Italian border into Austria. CBI - Burma: Day 93 of 99 of the Battle of Pakokku and Irrawaddy River operations in central Burma. CBI - China: Day 2,862 of 2,987 of the 2nd Sino-Japanese War. Day 37 of 91 of the Battle of Zhijiang. US 14th Air Force provides air support. Day 29 of 60 of the Battle of West Hunan (near Zhijiang). Japanese troops continue withdrawing from southern China. PTO - Caroline Islands: US 7th Air Force attacks a radio station, airfield installations, and gun positions on Moen and Falas Islands in Truk Atoll. PTO - Dutch East Indies: Day 7 of 52 of the Battle of Tarakan Island. PTO - Japan: US 20th Air Force B-29s bomb airfields at Usa, Oita, Ibusuki, and Kanoya on Kyushu Island. PTO - Japan: Day 37 of 83 of the Battle of Okinawa. PTO - New Guinea: Day 497 of 597 of the Battle of New Britain. US 10th Air Force provides air support. PTO - New Guinea: Day 381 of 481 of the Battle of Western New Guinea. US 10th Air Force provides air support. PTO - Philippines: Day 200 of 299 of the 2nd Battle of the Philippines, aka the Liberation of the Philippines or the Philippines Campaign. PTO - Philippines: Day 144 of 244 of the Battle of Luzon. 5th Air Force provides air support. PTO - Philippines: Day 59 of 159 of the Battle of Mindanao Island. 5th Air Force provides air support. PTO - Philippines: Day 51 of 135 of the Battle of the Visayas region. US 5th and 7th Air Forces provide air support. Italy: A British Military Court finds Field Marshal Albert Kesselring guilty of charges of shooting 335 Italians in the Ardeatine massacre and incitement to kill Italian civilians. He is sentenced him to death by firing squad, which is considered more honorable than hanging. But the verdict unleashes a storm of protest in the UK and Italy, branding it as too harsh, will lead to being commuted to life imprisonment on 04 Jul 47.